Investors Underground claims to be the number one trading community and home to some of the best traders in the world. However, how accurate is that statement and are the trading courses worth the money? ​That's exactly what we're going to find out in this Investors Underground review. A personal opinion of Investors Underground. Nathan Michaud established investors Underground in 2008. According to his website, http://nathanmichaud.com/, the finance graduate from the University of New Hampshire started trading in 2003, launching Investors Underground five years later. The platform offers an online trading community that connects users to experienced traders who provide professional guidance regarding day trading. Each evening Investors Underground provides a watchlist of stocks to trade the next day. Besides, its team of experts also provides useful insights during market hours in their live chat rooms. ​Momentum trader Josh supports Nathan at Investors Underground, as at the time of writing this post. Day Trading: This trading style involves the buying and selling of a financial instrument within the same trading day. Day traders rely on both technical and fundamental stocks analysis techniques when trading assets. Swing Trading: Unlike day traders, swing traders try to gain more from traded assets within days or weeks. Swing traders mostly utilize the technical analysis method to analyze stokes and price momentums. Fundamental Analysis: With this method, Investors Underground is able to analyze the intrinsic value of various assets by looking at the financial, economic, and other qualitative and quantitative parameters. Technical Analysis: This method analyzes the price action of the stocks of a company using statistical trends from past trades, price movements, and volume. Nathans trades cover everything – from penny stocks and small caps to the high price range and from shorting stocks to going long. However, he is especially effective when it comes to momentum stocks. His aim is to find opportunities at points of inflection and exhaustion while trading momo stocks. ("Momo" is a term related to advanced trading strategies based on momentum). ​We all know that even for the most brilliant expert it is impossible to be one hundred percent right all the time and so, also he is wrong and loses now and then. Day trading for beginners is hard. However, every day, there is a new ﻿day trading﻿ challange ​for Nathan as well. Breakouts: When you apply a breakout strategy, you take a position during the early stages of an uptrend. Breakdowns: This is the opposite of a breakout; traders who apply this strategy take an early position when the stocks take a downward trend. Options: This trading strategy enables traders to buy and sell stocks later if certain conditions are met. This means that you only commit to a trade if your conditions are met. Gaps: This strategy identifies price gaps of stocks at the closing point and within the first hour of opening a trade. Prices that rise above the observed range signal a buy while a fall signals a short. ​Investors Underground does not directly endorse any trading platform; however, they mentioned that DAS trader is the platform that they use in their day to day trading. The platform has been operational for 10 years now and offers real-time market data to investors, dealers, brokers, traders, institutions, and clearing firms. ​Investors Underground offers a number of products and services under its three membership categories; Starter, Most Popular, and Best Value. The Starter pack is currently priced at $1297 which lasts for 1 month, the Most Popular one is priced at $1497 which lasts for 3 months, while the Best Value one goes for $1997 and grants you access to the platform for a period of 1 year. ​The three packages offer pretty much the same features, however, the difference in their pricing comes as a result of the durations for each package. ​To give you a better view of the three packages, let’s discuss in detail the products and services offered by Investors Underground. The Investors Underground team shares stock watchlists with its users every night. Nate, Alex, Dante, and other team members provide stock watchlists for the next day’s trading. The watchlists normally include charts, tickers, as well as trading game plans. Apparently, the watchlist is not simply the obvious buy and sell recommendations. A typical day’s watchlist can consist of a decision to go short on stock X if it gaps up or go long if it has a weak open. The watchlists are normally diverse; they include penny stocks and stock over $100; additionally, they include day and swing trades, as well as short and long trades. Swing Trading Chat Room: This is a chatroom for swing traders who essentially hold stocks for days or weeks. The swing traders chat room is operated by Michele of TradeontheFly, and it contains long-term strategies and graphs. Momentum Trading Chat Room: Momentum contains traders who are keen on taking advantage of intraday price movements. This is the core of Investors Underground trading strategies, and it contains thousands of traders implementing numerous strategies. Penny Stock Chat Room: This is a room with traders who specialize in lower priced stocks. Stocks here may include certain cryptos with lower market values or conventional stocks. Just like the other chat rooms, the Penny Stock chat room features daily trading game plans. All the chat rooms are moderated by specific individuals under the leadership of Nathan Michaud; each of the chat room moderators possesses an enormous amount of trading experience to be able to make sound decisions. The chat rooms are operated 24 hours a day, trickling with tips every now and then. It is believed that this is the single most distinguishing feature between Investors Underground and the rest of the trading platforms. However, the membership costs $ 197 (IU Standard) to $ 297 (IU Elite) per month and beginners can not pay as much when they just started. In addition to the daily watch list, chat room access, one on one mentorship and four Q&A webinars a month with IU Standard, IU Elite comes with access to weekly trade recap videos and to the video lesson libary on top. The chat room has been established for beginners and more experienced professional traders. In this chat room beginners will not find many ways of the daily education they are might searching for. Some of the other services in this business offer clear trade alerts including the entry price, the profit target, the stop price and the position size, but beginners will miss this in the community of Investors Underground. Investors underground is more focused on being a community where any user participates within the chat. But there are nice functionalies within the room like private messaging, audio alerts and various filters for stock tickers, news, earnings and much more. Since so many people participate and since there is so much "noice" within the room, maybe you could better call their trade alerts trade ideas. For beginners looking for live trading only, it might be worth to consider the free Trade Ideas Chat Room as well. Investors Underground operates a fast-paced platform that accommodates all the skill level traders. If you’re a beginner or an advanced trader, you’re likely to fit in quite easy depending on the package you subscribe to. Investors Underground has built-in tools to help its users, especially the beginner ones; users who subscribe for the Best Value package are treated to every tool available on the platform. One of the core features therein is the weekly trades Recap which can be accessed from the video library. This feature enables users to watch daily trading concepts and market activities. In case you got lost in the chat room, you can easily revisit the recap videos and watch the trading concepts discussed earlier on. But the recaps are not just for beginners; they can also be used by the advanced users to understand the basic strategies behind certain trades. For instance, if you traded a stock but got stopped out early, you can review the recap videos to see how an expert trader such as Nathan approached a similar trade. If you’re keen on learning to trade, these are perhaps the most crucial products that come with the platform. 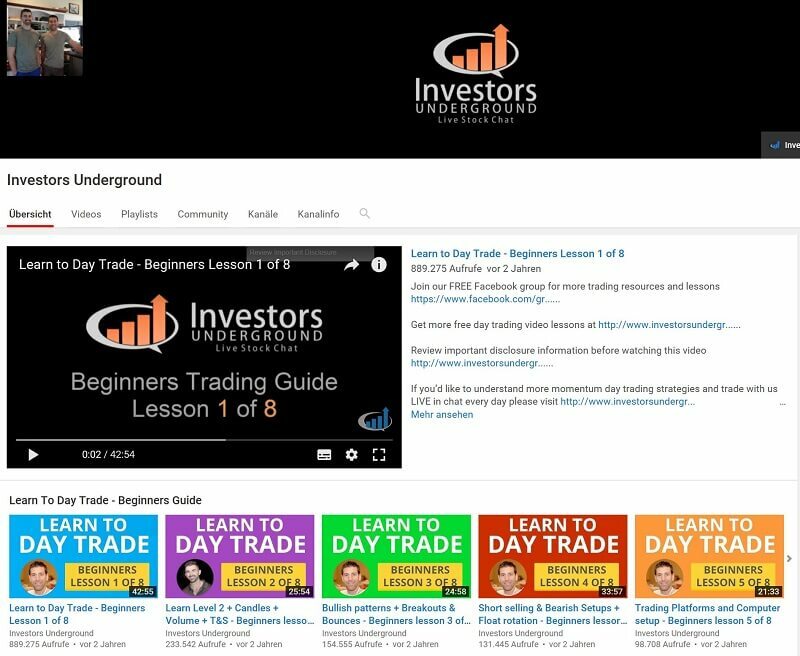 It is perfect for day trading beginners that Investors Underground offers a big number of free videos on YouTube and starters can surely benefit from this. Investors Underground also provides its users with regular educational webinars that contain fundamental and advanced trading strategies. The webinars are schedules a couple of times during a month. The main purpose of the webinars is to discuss recent market recaps, and generally checking in on members experiences. Most of the time, members of the platform are given a chance to ask questions on the areas they feel need to be addressed. The Q&A session is also a way for the moderators to get feedback on any areas of concern. New users are always especially encouraged to take advantage of the webinar sessions especially if they got lost during the fast-paced chat room conversations. The best thing about the webinar sessions is that you can pretty much ask anything from the usage of some functions on the platform to complex concepts relating to trading. Of course, the chat rooms serve the same purpose; however, with webinars, you can get an in-depth explanation of anything making it easier to understand and memorize. Each and every trader is always encouraged not to miss the webinar sessions simply because according to them, they offer a better mode of interaction between the users and the moderators. ​Now that you know what’s included in each package, let’s look at the courses offered at Investors Underground. The platform allows users to gain access to its course after paying a fee that enables them to stream the content. The courses offered on the platform are categorized into two depending on your level of experience. The beginners are required to sign up for the Textbook Trading Package while the advanced ones can go for the Tandem Trader Package. Let’s briefly discuss each of the courses. ​This is a complete trading course with the fundamental concepts to enable you to understand what trading is all about. The course mainly contains intermediate trading concepts; however, it also covers some aspects of advanced day trading. Choosing a Broker and many more. ​Like I mentioned earlier, Tandem is meant for the advanced traders. It essentially serves as an advanced level of the Textbook trading course and it elaborates more on the concepts learned at the intermediary level. If you start your trading journey at Investors Underground, it is important to note that the Textbook Trading course is a prerequisite when looking to join the Tandem level. 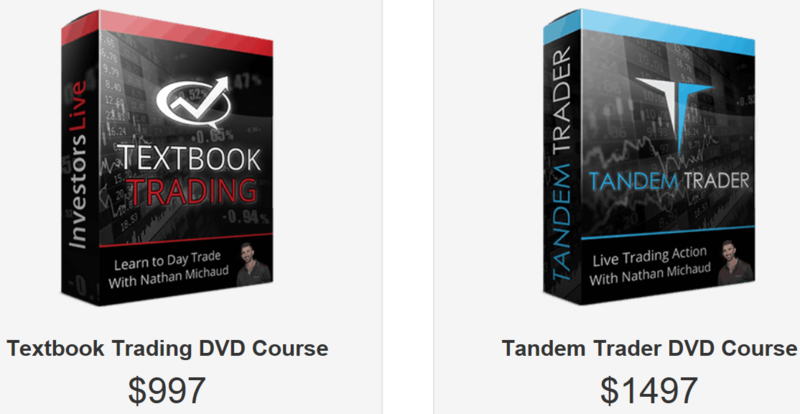 Unlike the Textbook course, Tandem is considered to be more of action-oriented kind of trading in the sense that it focuses more on the practical aspects of trading while the lower level is a mix of both theoretical and practical lessons. The course provides real-life trading recordings with commentaries from the moderators of the platform. The concepts discussed here are quite complex; if you haven’t had any trading experience before, you might find it hard following through this course. Most terminologies used at the advanced level are discussed at the intermediary level; this is perhaps why they appeal to each trader to start their journey at the Textbook Trading course level. There you have it; these are the main aspects of the products and services offered by Investors Underground. Of course, it may not be possible to discuss every tiny detail of their plans but you can be sure that there are no material omissions from what we have above. ​Now that you’re aware of what takes place at Investors Underground, it is important for us to rank it according to some key parameters that apply across similar platforms. User Experience based on reviews on the website: Great for experienced traders, seasoned traders, great customer support. ​Investors Underground seem to be enjoying a fairly decent reputation online. The platform serves thousands of users around the world and is manned by a team of experienced moderators with decades of experience. ​Nate succeeded in establishing a community of skilled and experienced traders and investors. He and Timothy Sykes belong to the very first educators who created day trading chat rooms. When you compare Nate with many of the younger traders and moderators of similar chat rooms, it is still his big advantage to have so many years of trading experience. In this business, outstanding talent and professional skills as a day trader are highly relevant. Investors Underground is a well-established community with educational resources. ​​Investors Underground is a well-established community for more than ten years, and their products are mainly for those looking to take part in day trading. As with any trading course provider and similar educators and chat rooms like Jason Bond Picks, Warrior Trading, and ClayTrader​, the principle of caution applies here as well. Traders who are looking for an all in one solution with a free trial and a good money back guarantee, should take a closer look at Trade Ideas​' offer. First, test the free offers and check carefully whether the offer corresponds to your expectations. If you have any concrete questions, write an email to Investors Underground support.